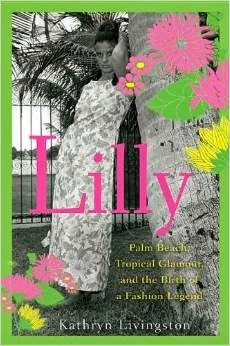 I was sent a copy of the book Lilly: Palm Beach, Tropical Glamour, and the Birth of a Fashion Legend by Kathryn Livingston. This book did not disappoint! Add it to your summer reading list. I have actually been on a work trip for the past week and this was the perfect poolside read. I am about halfway through the book and will be finished by this weekend. The book is written by Kathryn Livingston, who started as a staff writer at Harper's Bazaar and then became an editor at Town & Country. More recently she has worked at Time Inc and Tiffany & Co. In the middle of the book there are several pages of photos from throughout Lilly's life: her childhood, her first marriage, her children, her second marriage, her business, and all of her famous customers like Jacqueline Kennedy. The book takes you from the very beginning of Lilly's fashion business (the juice stand days when she was a mother to three young children) to the brand's revival in recent years. I am interested to read that last chapter as I met James Bradbeer and Scott Beaumont when I went to the Lilly Pulitzer Martha Stewart special in New York back in 2009. Relaunching a brand is never easy so I applaud them for bringing Lilly back! I highly recommend picking up this book. If you are looking for something fun to read at the beach or pool this definitely fits the bill! Lilly Pulitzer truly lived a colorful life! I loved this book, I loved learning so much about Lilly's family and her life growing up, so interesting! Her family history is pretty interesting. I hadn't realized she got married as young as she did. And then having three kids so close in age! I LOVED this book... always thought I knew so much about Lilly, but couldn't believe how much I didn't before reading it! I found it so inspirational too. Exactly! I didn't realize that she had really struggled after the birth of her third child. How wonderful that her hobby became such a successful business! I saw that book last weekend at the bookstore I went to! I need to read it! I've never heard of this! I'm so excited to read it! It was a fast read, perfect for summer! I think you would really like it!